Pokémon Go! And So They Went. No one likes being a third wheel. It's awkward and can sometimes be lonely. I am currently a third wheel as my friends are gripping to their love of their lives AKA their Pokémon. I don't know how it happened. No one does. But whether you're a fan or not, you cannot escape this latest craze of Pokémon Go. For me, my Pokémon remains on my Gameboy Colour in 2004 with a bad hair cut. Yet, for the majority of the nation, so it seems, their Pokémon are in their bedrooms, in the local park (did you see the video of Central Park?) and in the middle of a pond. People are going nuts for it! Don't get me wrong, it looks fun and people are going in groups to walk around their towns and cities to catch them all but if you're not part of it, it's very much a lonely place. So for you non pokemon go-ers, I have gathered together 6 situations you might find yourself in. 1. Classic Third Wheel. They're staring lovingly at their phones while your yapping away about the serious drama that is Hiddleswift, Calvin's torn heart and KimYe. You persevere until your friends start talking to each other about what Pokémon's they caught and the drama that occurred when they received that message; "Server is down". Meanwhile, you sit back in silence and scroll through instagram or swipe across Tinder, hoping to catch a date. 2. Your friends cancel plans so they can be with their Poké-baes. Want to go out for lunch? No chance, your mates are half way up Arthur's seat looking for Pikachu. Time to get back into your pj's and binge watch Orphan Black (how good is that show by the way?!) alone with a big bag of chocy buttons. 3. Dinner cut short. So maybe your friends are decent and don't cancel on you. You go for dinner. But wait! There's a Jigglypuff just down the street! 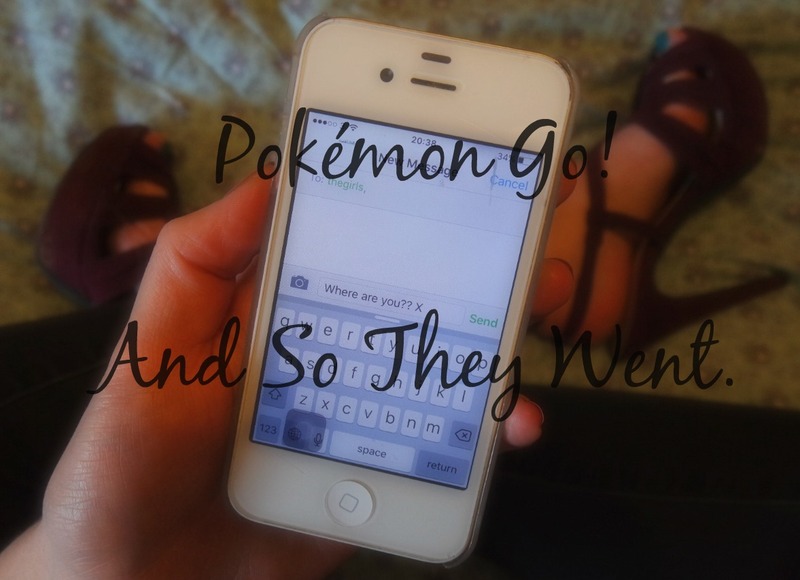 Off they run, phones in hand as they go and catch them all. Meanwhile the waiter comes over to you, little loner...with the bill. 4. Misunderstood showcasing. Friends are crowded round someone phone, aww-ing and ooh-ing. It must be a cute cat right? One of those funny memes of a cat stuck in a jar or a sink. Nope. Prepared to be heart broken. It's just the fluffy Pokémon one. It's cute...not as cute as the cat though. 5. They're beating you on fitbit. They've walked, most likely run at points too, a hell'a lot to find their Pokémons while you've been netflix and chilling with Ben and Jerry. 6. Don't get invited to the Poké-parties. There's going to be a legendary Pokémon pub crawl. Everyone who is everyone is going. Your mates, your work mates and parents, cousins and 'Cool Aunt Debra'. And you're not. Another night in with Netflix, half way through a series...And then you download Pokémon Go. Lets face it. It's like being the non smoker at a party, you're missing out on the kitchen banter and the peer pressure is slowly building. Who knows how long you will last until you finally give in and download it, you know, just to see what the fuss is about. But until that time comes, us non Pokémon catchers will just have to grin and bear it as our mates run around in a love affair. Farewell friends, may you catch plenty. I'll be right here with netflix until your return. Listen Up! Johannesburg. Album Review.